Dealing with wet kids and sheets in the middle of the night is no fun. There are so many techniques and tips a parent or caregiver can utilize when approaching a bedwetting problem. For caregivers, laundry becomes a daunting task when you have to strip and wash bed linens daily (or nightly). Your child’s self esteem can suffer when they are constantly dealing with nighttime accidents. Sleepovers can become problematic for kids who are dealing with bedwetting, also known as, nocturnal enuresis. If your child has become fearful of having accidents at night and it is preventing them from participating in social events like sleep over camp or staying the night over at a friend’s house, then it is time to take action. The alarm wakens and motivates your child to go to the bathroom to finish urinating. Measures 2 inches square and weighs only 1oz. The enuresis alarm comes backed by a 1 year warranty. Quick Detect senses the first drop of urine to quickly alert the child as bed wetting begins. 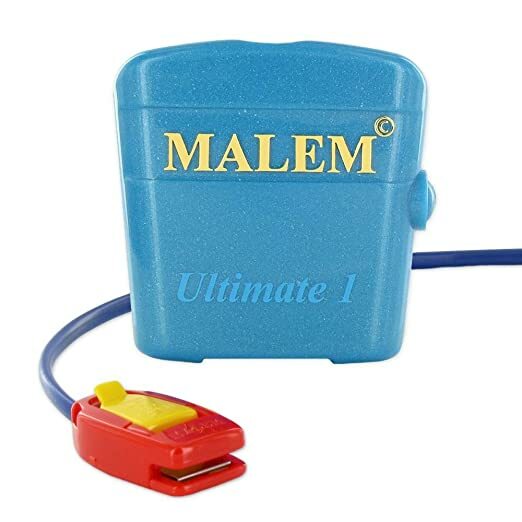 Malem bedwetting alarms have won numerous awards, been proven in clinical trials, and are recommended by doctors and pediatricians around the world. Compact alarm unit weighs just 1oz, IntelliFlex sensor takes body shape for maximum comfort and will not poke like some clip sensors. Sensor can be reused within seconds by patting dry. Includes: STOPEE -the most advanced and safe bed-pad and alarm system available today. All children grow and mature at different rates the same is true for their bladders. It is common for a child to be continuing to learn bladder control on into the school years and nighttime accidents are simply part of the learning process for some children. You don't have to let damp sheets get you down. If by age 5 or 6, your child is still bedwetting there's a great product, a bedwetting or enuresis alarm. This alarm works by sounding a reminder at the first sign of wetness when your child begins to have a accident. A bedwetting alarm helps the child to awaken and finish their business in the bathroom instead of the bed. First and foremost it's important to remember that bedwetting is actually very common, even after the age of 5. Make sure to talk kindly and be understanding with your child when it comes to bedwetting. Things like positive talk and rewarding dry nights can be a very effective tool to for caregivers and when used in conjunction with a bedwetting alarm can offer a great solution to a messy problem. It is also important to be aware that using negative talk can worsen the problem by creating stress on the child. Stress is known to cause or increase nocturnal enuresis, so being calm and keeping a cool head are important when speaking to your child about accidents. Parents that had bedwetting problems as a child are more likely to have children with the same problematic behavior. Using your past problem to relate to your child can be extremely helpful by encouraging them and helping the child to understand that bedwetting is common and nothing to be ashamed of. More often than not, bedwetting is not a medical problem. It is far more likely that your child’s bedwetting is a matter of lack of bladder maturity, heavy or deep sleeping, or simply a genetic issue passed down from a parent. It's always a good idea to check with a medical professional before beginning any type of treatment for nocturnal enuresis, but bedwetting alarms are considered safe and very effective. Bedwetting alarms are one of the most commonly used tools when combatting nocturnal enuresis. Using these tips in addition to a good bedwetting alarm system can produce a positive result in as quickly as two weeks. Some bedwetting alarms clip to undergarments or pajamas using pins and various fasteners, so be mindful of the type of sleeping environment that is the most common and comfortable for your child. There are models that simply lay over the bed, so if your little one is easily annoyed by clothing and tags, this may be a better option. Be sure to also take into account the type of sleeping habits your child displays; some models use sound, some use vibration, while others use a combination of the two and may even include bright light alarms. Some bedwetting alarms even have software and apps for both parents and kids. By using a good bedwetting alarm, practicing patience, and using positive reinforcement; bedwetting cessation can be stress free for both parents and children. 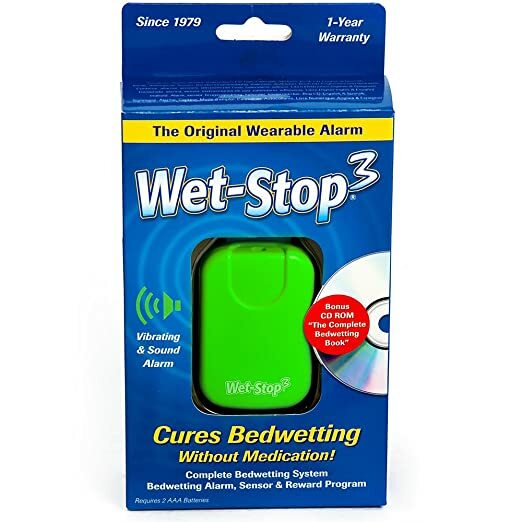 The Wet Stop 3 is the one of the more inexpensive models. With over 35 years of experience, this company is in the business of keeping your child dry. The Wet Stop 3 comes in multiple colors and that can make your child feel more excited about solving their bedwetting. Children that feel they have a say in the decision making process can achieve better results. The variable alarms on this model are great for children that may get used to the same alarm sound over time. The Wet Stop 3 comes with a CD book, stickers, and calendar for additional positive reinforcement. Another good feature of the Wet Stop is that it includes a 1 year warranty. This model comes with a smartphone app that answers many user questions. Award winning and lightweight; this is a great model for deep sleepers. The Malem Ultimate includes vibration, sound and light alarms. Weighing only an ounce, the Malem Ultimate is known for being compact and able to stay in place without creating an annoyance to your child. This compact model detects fabric wetness very quickly. The Malem Ultimate alarm is made of two parts. The wetness detector clips the the child’s underwear and the alarm attaches to the child’s pajama shirt. Some children may be bothered by the wire that goes under the shirt, so that is something that need to be taken into consideration. The DryEasy detects urine very quickly as well. Using a controllable volume with 6 different sounds, this model is a good choice if a child gets used to the same alarm sound. This model includes a setting where the alarm sounds are played at random, making it nearly impossible to sleep through. The DryEasy also includes a vibration setting that can be paired with the audible alarm. 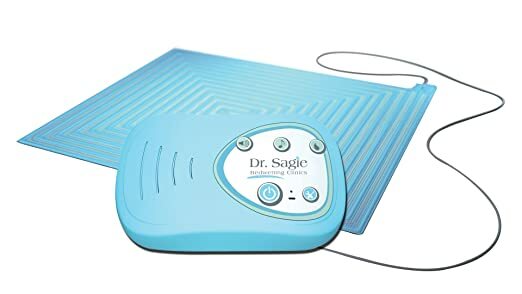 For children that awaken easily or may be startled by the alarm, a vibration can be used alone to awaken the child and get them to the bathroom quickly. DryEasy attaches to undergarments and a pajama shirt so the presence of wires is something to note, but the DryEasy is one of the fastest models to detect the first drop of wetness. Quick detection of wetness is crucial in getting to the bathroom so this model is very effective. 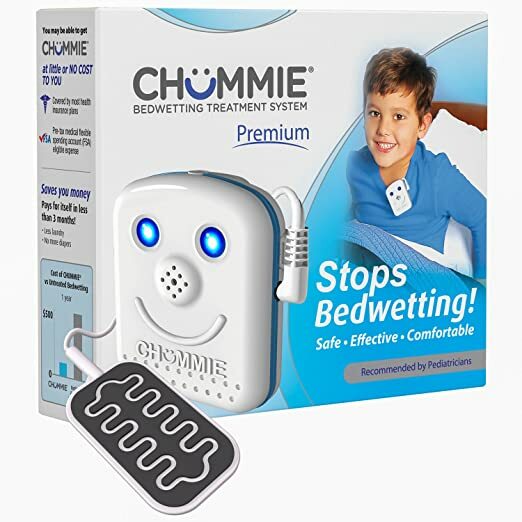 For children having multiple episodes a night, the Chummie can be patted dry and reused immediately. This is a great feature to get you and your youngster back to bed quickly. The Chummie Includes a mobile app that has instructional videos and frequently asked questions right at your fingertips. This is another one of the more lightweight models, coming in at about an ounce and would be a good choice for children who may find other alarms cumbersome. The Chummie pairs with an armband (purchased separately) for the alarm, offering even more comfortable options for your child. One of the more unique features on the Chummie is the 8 alarm sounds, controllable volume, vibration and lights. So if sound and vibration isn’t enough to wake your deep sleeper, this model makes an excellent choice. TheraPee takes a different approach. Where the other models use a wetness meter that needs to attach to your child’s undergarments, this is a bed pad type model. TheraPee is one of the more expensive systems, but easily one of the most dependable bedwetting alarms. TheraPee takes a dual approach to nocturnal enuresis cessation; offering digital interactive software customized to your child. The software that is included with this model uses cognitive behavior therapy developed by a renowned child psychologist. TheraPee utilizes both state of art technology and incorporates it with unique and personalized therapy, making it the most well rounded of all the devices. Night time accidents don’t have to be a huge challenge in you or your child’s life. 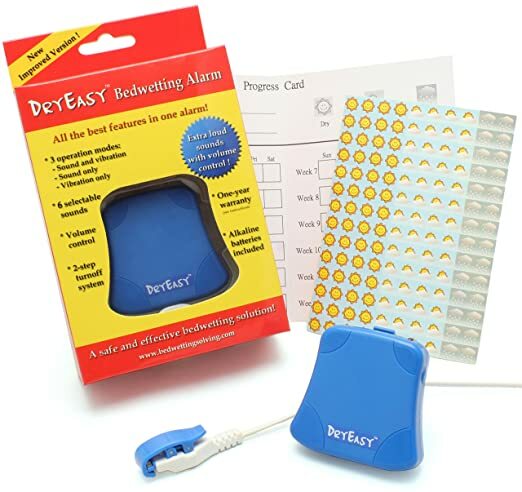 Purchasing a good bedwetting alarm is the one of the first steps recommended by doctors in the treatment of nocturnal enuresis; they are safe and have options to suit the needs of any child. In a few weeks, you and your child can be enjoying a good night’s sleep without ever having to change the sheets.